HF / News - Hardwell’s Top 5 Miami Music Week Moments. Hardwell is a name synonymous with Miami Music Week. A famed headliner for Ultra Music Festival, he’s also a renowned party host during the week with his popular showcase event with Revealed. Sadly, this year Hardwell will be a name missing from the A-Z of DJ’s that will swoop through the city of Miami. Announcing he was taking a sabbatical back in October 2018 and with his last show being a now legendary ‘signing off’ show at the Ziggo Dome in Amsterdam during ADE – where he appeared with the Metropole Orkest for a very special history of dance music event. Hardwell’s trademark beats will be a sad and sorely missed addition to Miami Music Week / Ultra Music Festival! In a reflection of his stamp on the city, we look back at a handful of his finest moments during previous Miami Music Week editions. Hardwell on the Ultra Music Festival mainstage! 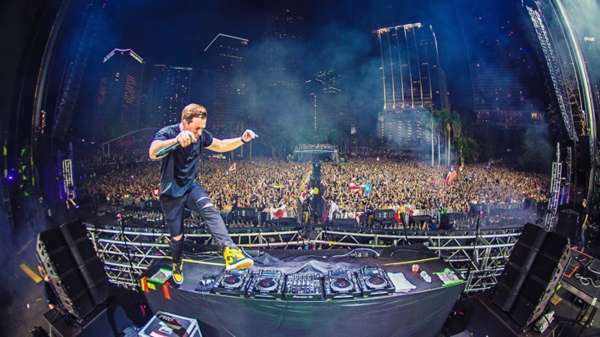 Being an artist on everyone's lips, Hardwell played his first set on the Ultra Music Festival mainstage. This set fell within a run of 70+ shows that Hardwell performed within 2012 while promoting his first major release ‘Spaceman’. He played the far reaches of the globe with sets in the USA, Asia, Brazil and all across Europe. Cementing himself as one to watch with each show! 2013 Ultra Music Festival’s Fan Favourite Set! Hardwell’s set at the 2013 Ultra Music Festival was a stand-out fan favourite for the whole of Miami Music week for many. Not only did he play to the masses at Bayfront Park but also to the 90,000 fans that tuned in and watched his entire set be streamed via UMFTV! The stream itself broke the previous record for live streams at Ultra previously held by Swedish House Mafia. Within his set Hardwell played ten unreleased tracks in amongst his setlist including new remixes of ‘Calling’ and ‘Apollo’. Revealed Recordings live at Nicki Beach! Hardwell brought his world-renowned record label Revealed Recordings and his many artists to Miami Music Week in 2016 for a star-studded event! The line up merged both well known Revealed artists such as Dannic and Dyro with the new faces of Kura and Julian Jordan to create an out of the world experience for the fans of the label and the wider genre alike! Hardwell combined his passion for including all fans and newer technologies and decided to not only live stream his Ultra Music Festival 2016 set but do it with 360-degree VR viewing, the first of its kind! During his performance, the fans at home could choose between watching Hardwell do what he does best and watching the pumping crowd dancing away to song after song! At Miami Music Week 2018 Hardwell was welcomed to the stage fondly by the masses that came to watch him celebrate the 20th anniversary of Ultra Music Festival! Within his set Hardwell debuted 5 new IDs collaborating with the likes of SICK INDIVIDUALS, Maddix, Olly James and John Christian. Proving once again why he is one of the biggest DJ’s in the world and pulls in bigger crowd’s year on year!